Need a good creative writing high school curriculum? Creativity is necessary for excellence in all writing formats. Once homeschooling high schoolers graduate, they will need to be able to communicate in ways that interest employers, Sunday school classes, ministries, or any other place God puts them. Homeschoolers can develop confidence in their creativity skills by having some fun with their writing assignments using 7Sisters creative writing high school curriculum guides. 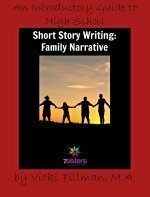 Introductory Guide to High School Short Story Writing: Family Narrative is a 5- week, 23-page downloadable pdf writing guide, written by Vicki Tillman to encourage students to capture their creativity by sharing a family story.